Hastily dubbed the new capital in 1847, Lansing overcame derision and setbacks to become a booming metropolis. Yet its rich history hides chilling legends. Bertie Clippinger plays tricks on the unwary at the Capitol Building, where the teen accidentally fell to his death when a game went horribly wrong. One of Lansing's founding families keeps a spectral vigil over its homestead, the Turner Dodge House. Malevolent spirits, believed to be either neglected students or victims of something far more sinister, stalk the derelict Michigan School for the Blind. A witch's vengeful curse follows those who trespass on Seven Gables Road, one of the state's most haunted stretches. Founder of Demented Mitten Tours and local author Jenn Carpenter leads readers to the dark side of the Capital City. 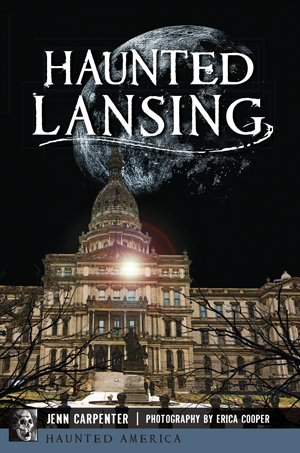 Lansing native Jenn Carpenter is an avid writer, lover of the paranormal and true crime junkie. She has written for a number of publications over the years but discovered her true passion when she founded Demented Mitten Tours, a paranormal touring company based out of Mid-Michigan. When she’s not regaling the masses with her macabre tales, she’s often enjoying a quiet night at home with her husband, their four boys and four dogs. Her interests include renovating her family’s century-old Victorian abode, taking weird vacations and binge-watching Game of Thrones.